At Just Blinds well-designed window fashions do more than simply cover a window. Window Fashions from Hunter Douglas offer great design is beautiful to live with, provides variable light control, insulates rooms against heat and cold while saving energy, protects your furnishings from damaging UV rays, and even absorbs sound, improving the acoustics in a room. And, the Hunter Douglas advanced operating systems make using our products a pleasure every day. 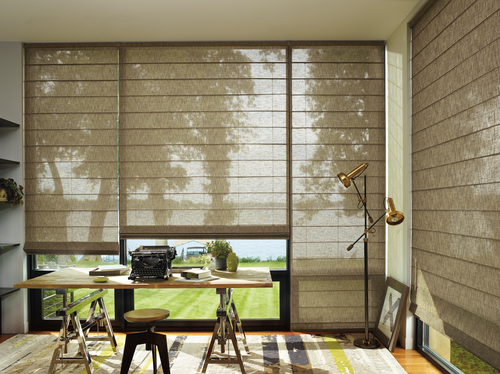 Transform the sunlight through your windows with our Silhouette® and The Alustra® Collection of Silhouette® shadings. Perfectly illuminate your surroundings by diffusing harsh sunlight and dispersing it evenly throughout your room. Let Just Blinds provide you with quality Hunter Douglas Silhouette® shades. Our innovative Pirouette® shadings feature soft horizontal fabric vanes attached to a single sheer backing, allowing for enhanced views to the outside while maintaining privacy and the full beauty of the fabric appearance on the inside. 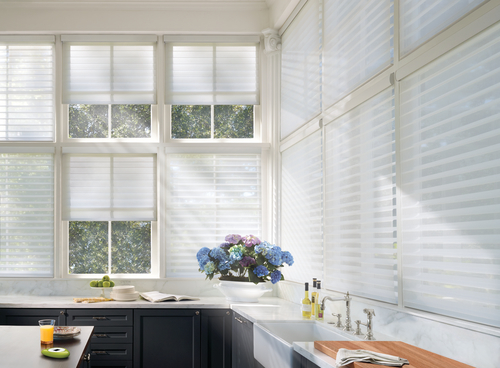 Let Just Blinds professionally install your Hunter Douglas Pirouette® shades. Similar to draperies, our Luminette® vertical sheers are ideal for larger windows and sliding glass doors. 180-degree rotating fabric vanes put you in control of your natural light and privacy. Let Just Blinds give your home a distinctive feel with Hunter Douglas Luminette® vertical sheers. Our Duette® and Duette Architella® honeycomb shades keep your home warm in the winter and cool in the summer. An array of fabrics and a Vertiglide™ option for large windows and sliding doors make it the top-selling product in the industry. Let Just Blinds custom install your Hunter Douglas Duette® honeycomb shades. 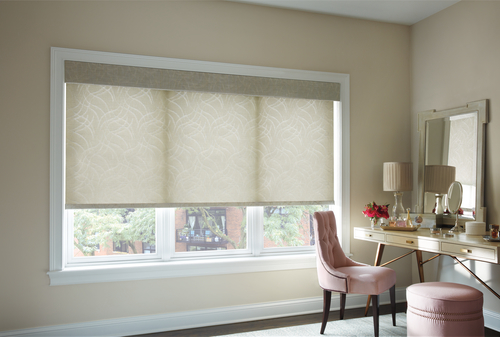 A fashionable take on traditional Roman shades, our Vignette® and The Alustra® Collection of Vignette® Modern Roman Shades roll, stack, and traverse with consistent folds and no exposed rear cords for enhanced child and pet safety. 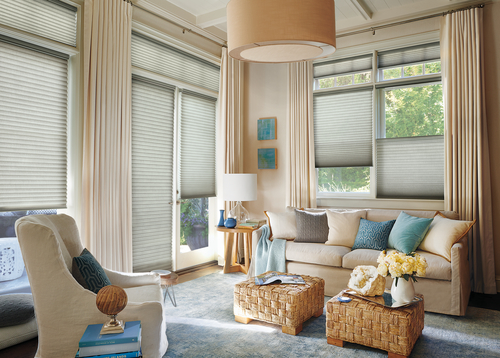 Let Just Blinds enhance your home with Hunter Douglas Vignette® Roman shades. Our Skyline® and The Alustra® Collection of Skyline® Gliding Window Panels are a patented twist on vertical blinds. A sleek, up-to-date design lends drama to any décor, whether covering large windows or when used as a unique room divider. Let Just Blinds custom tailor your Hunter Douglas Skyline® Gliding Window Panels. Our Designer Roller Shades combine the ease and simplicity of a roller shade with hundreds of fabric choices – sheers to opaques, patterns to textures, and traditional solid colors. For excellent UV protection while maintaining your view of the outdoors, our Designer Screen Shades are available in varying levels of opacity. Offering a minimal yet sophisticated shade with light control, color and style – a perfect roller screen shade for your patio or sunroom. An innovative alternative to woven woods and solar screens, The Alustra® Collection of Roller Shades artfully blend unique fibers and sophisticated design to create distinctive light filtering fabrics. Up to 50% of your home’s heating and cooling energy can be lost through your windows. At Hunter Douglas, we’re an industry leader in making a big energy savings difference at the window. The Hunter Douglas Lifetime Guarantee is an expression of our desire to provide a thoroughly satisfying experience when selecting, purchasing and living with your window fashion products. What is Covered by Hunter Douglas Lifetime Guarantee?